Associated Press Supreme Court nominee Brett Kavanaugh testifies Wednesday before the Senate Judiciary Committee on Capitol Hill. 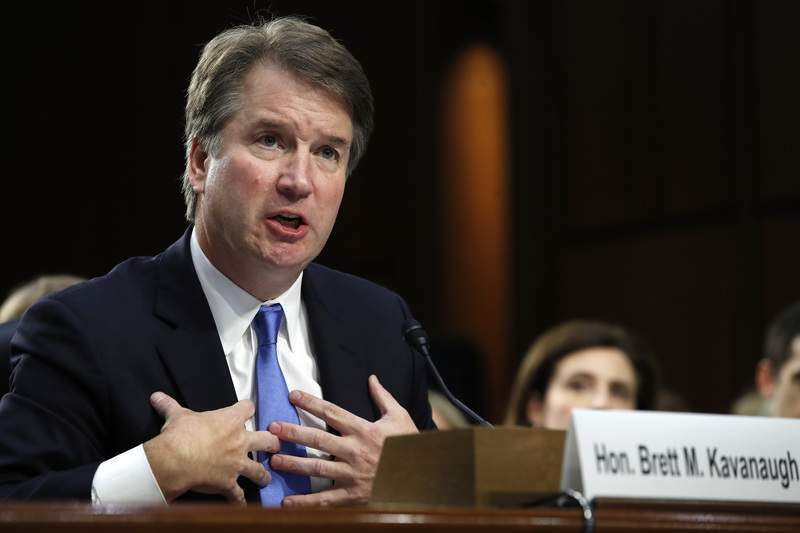 WASHINGTON – Pressured by Democrats with President Donald Trump on their minds, Supreme Court nominee Brett Kavanaugh rejected repeated efforts at Wednesday's Senate confirmation hearing to reveal his views about a president pardoning himself or being forced to testify in a criminal case. The Senate Judicial Committee hearing has strong political overtones ahead of the November congressional elections, but as a practical matter, Democrats lack the votes to block Kavanaugh's confirmation. They are concerned that Kavanaugh will push the court to the right on abortion, guns and other issues, and that he will side with Trump in cases stemming from special counsel Robert Mueller's investigation of Russian interference in the 2016 election and possible ties to the Trump campaign. The 53-year-old appellate judge answered cautiously when asked about most of those matters, refusing an invitation from Democratic Sen. Richard Blumenthal of Connecticut to pledge to step aside from any Supreme Court cases dealing with Trump and Mueller's investigation. The Democrats weren't the only ones who recognized the importance of questions about Trump and the Russia investigation. Committee Chairman Chuck Grassley, an Iowa Republican, asked Kavanaugh right away whether he would be independent from the president who chose him for a highly prestigious lifetime position. He cited historic cases including the Brown v. Board of Education ruling that desegregated schools and the U.S. v. Nixon decision that compelled the president to turn over the Watergate tapes – a ruling that Kavanaugh had previously questioned. “Respect for precedent is important. ... Precedent is rooted right in the Constitution itself,” he said. Kavanaugh likened Roe v. Wade to another controversial, landmark Supreme Court decision, the Miranda ruling about the rights of criminal suspects.